Now that I finally understand the heating elements of my oven, I am on a baking craze. Now today’s recipe is pretty basic, and I have been told my baking is nothing but basic, but I decided to stick with tradition. 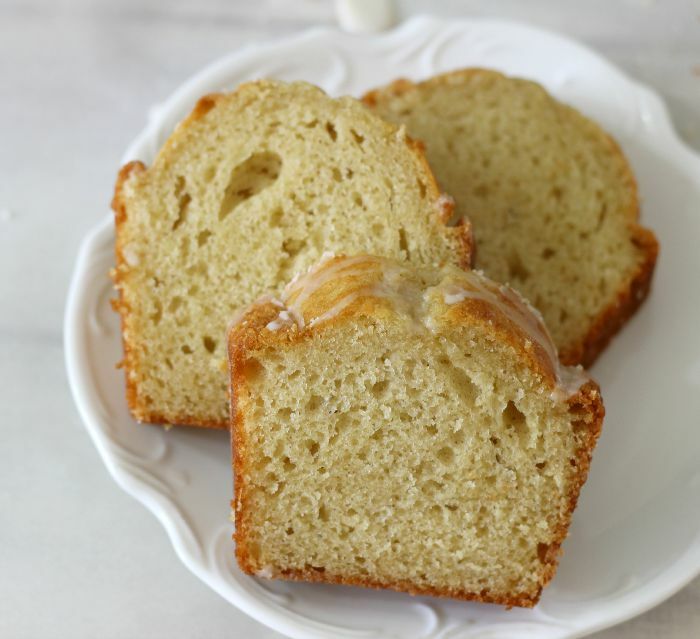 I have for you an amazing quick bread that is prefect with morning coffee, afternoon tea or a snack, it is my Vanilla Yogurt Bread. The bread is light, fluffy and reminds me of vanilla cake. I love it. It would go great plain or you can dress it up with some berries and a dollop of whip cream. 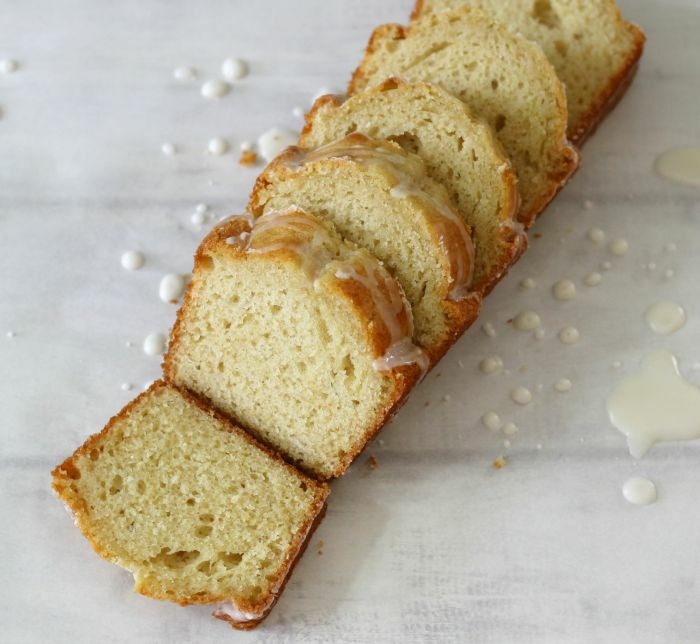 To give the bread a more vanilla flavor, I added a simple vanilla glaze to go over the top. You have to love the glaze! 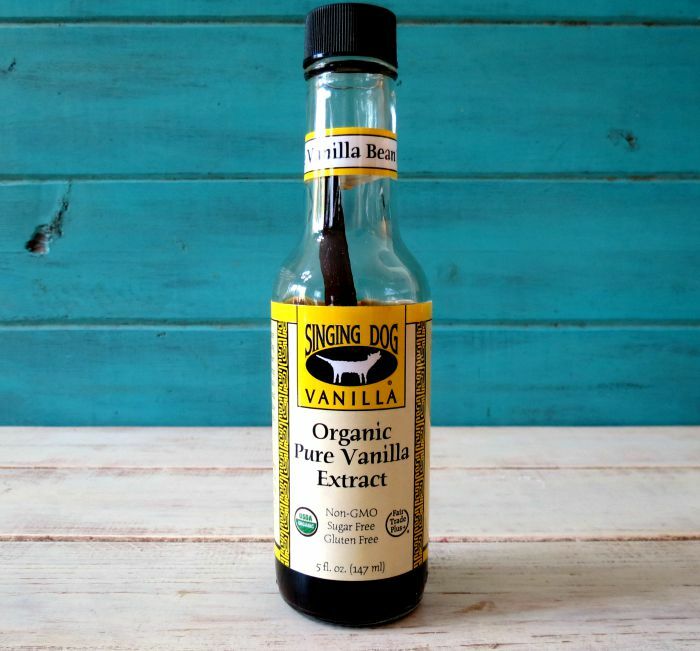 For the vanilla flavor I used vanilla greek yogurt and Singing Dog Vanilla Extract. Have you ever heard of Singing Dog? The Extract is organic, non-GMO, gluten free and no sugar added. Plus it even has a vanilla bean in the bottle. How cute is that? It is pure vanilla goodness and oh the smell of it is amazing. I swear I could wear it. He he Matter in fact I did. I got a little bit on my hand and I just rubbed my hands together and mmmmm, vanilla. 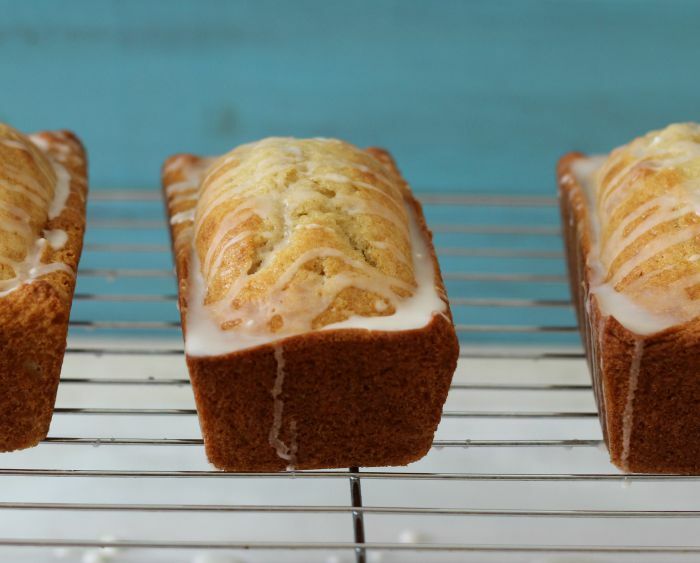 For making the bread, I used 3 mini loaf pans, but you can also use one traditional loaf pan. I like making 3 of them, so I can share them with friends and family. I also freeze the loaves so my Husband can take them to work for his lunches. The glaze freezes nicely too. 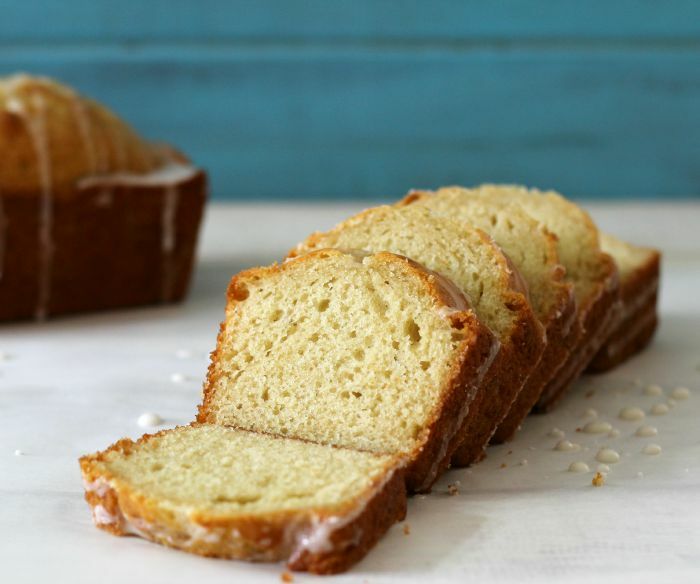 A light, fluffy, moist quick bread that is purely vanilla flavor. Perfect for pairing with berries and whip cream. In a bowl, add flour, sugar, baking powder, baking soda,and salt; mix until combined. In a large bowl, add eggs, vanilla extract, yogurt, canola oil, and milk; mix until well combined. Slowly mix in flour mixture, just until combined. Pour mixture into prepared baking pan or pans. Bake for 50 - 60 minutes for single loaf pan or 25-35 minutes for mini loaf pans, until center of bread comes out clean with a toothpick. Cool for about 10 minutes and with a butter knife, go around the edges of the pan and let bread cool completely on cooling rack. 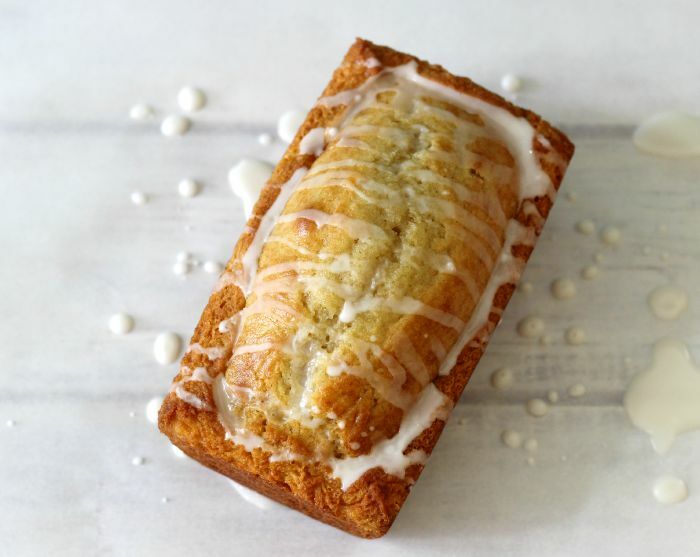 Calories will be less by about 25 per slice if you only use half of the glaze in this recipe. To get the right constancy and flavor you need to make more than you need. I love quick breads and this one is coffee-house quality. I am pretty proud of it and I simply can’t get over the great vanilla flavor it has. I can’t wait to share it at work. Thank you! looks so yummy! Is it really 2 tbsp of vanilla? I been looking for a bread recipe that includes yogurt.. Really enjoy your recipes! Thank you! I really like vanilla, so glad it freezes well. I was thinking of trying this in the individual baking cups, brand-name, Freshware. I mention the brand because easy cleanup and bakes nicely.. They are really nice for making small portion sizes, like trying different additions to them. this looks so delicious and I could have this every morning with my Starbucks. Perfect pair to my morning coffee!! I am so glad you like it! It’s such a nice simple bread and you can add fruit in it to for extra flavor. Just made this. Very easy to make and wow extremely tasty. My hubby is going to love this with his morning tea at work. Would there be a major difference if I wanted to make them in a muffin tin ? I don’t see why not. Just watch the cooking time. Start watching at he 20 minute mark. Enjoy! I hope they turn out.